City Hall historic preservation planner Anya Grahn, John Sale, who is the director of mountain planning at Park City Mountain Resort, and Bill Rock, the PCMR chief operating officer, join Historic Preservation Board members Lola Beatlebrox, David White, Puggy Holmgren and Randy Scott for a recent presentation at the Park City Library honoring the work at the site of the California-Comstock Mine. 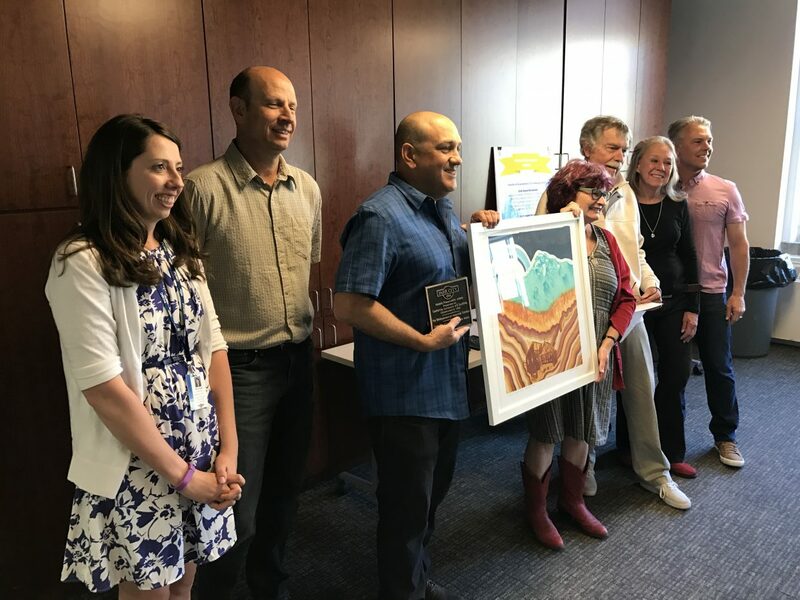 Park City recently honored work at the site of the California-Comstock Mine on the slopes of Park City Mountain Resort with a Historic Preservation Award, given to projects that advance City Hall's desire to ensure the historic fabric of the community remains intact. City Hall, PCMR and a group known as Friends of Ski Mountain Mining History teamed for the work, which included stabilizing the wooden building with a foundation made of stacked stones. A painting of the California-Comstock Mine commissioned as part of the award recognition, displayed by Rock and Beatlebrox, will hang at the Marsac Building. The California-Comstock Mine work was previously honored by Preservation Utah, a statewide organization, with an annual award as well. The award was in the category of stabilization, restoration or renovation. City Hall, a Vail Resorts subsidiary and the Friends of Ski Mountain Mining History were listed as the nominees.